The breath must be done through the nose because the nose filters out the nasties and warms the air so the the respiratory system is protected from the damage of cold air. To begin,place one hand on your belly and another on your chest. As you breathe in, start by expanding your diaphragm (which is the muscle between your chest and your abdomen), you will feel your stomach pushing slightly into your hand. Slowly now, as you continue to inhale, expand the bottom of your chest. As you are filling the lower part of your lungs, now your upper chest expands, filling with air (you can feel this expansion through the hand on your chest). Once your lungs are completely full, pause, holding the breath for a couple of seconds. 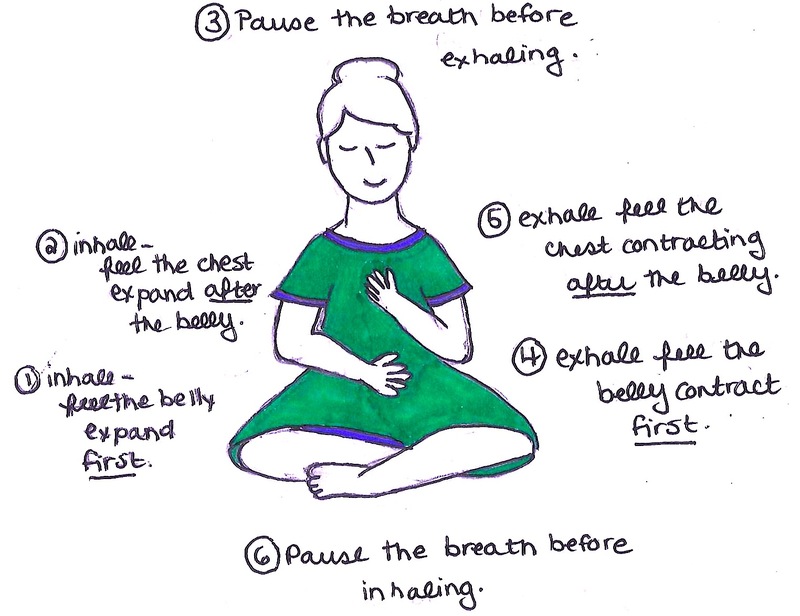 Exhale (through the nose) by bringing in the stomach, and then contracting the chest (remember the breath is initiated with the stomach). Exhaling out all of the air. Pause again for a couple of seconds before inhaling. It is important to remember that the diaphragm (or the belly) is the natural driver of the breath. When you are in a natural breathing pattern you will feel the belly expand on the inhale and pull in on the exhale. If you watch a baby sleeping you will see this beautiful pattern of breathing. Most of us however, actually do the opposite when we are breathing. This is because most people breathe very shallowly. This kind of breathing is driven by muscles in the upper chest, shoulders and even your neck. No wonder then that we have tension in these areas. The muscles here are working hard all day long at a job they were not designed to do! So, give this complete breath pattern a minute a day. Practicing will retrain your body in a natural rhythm of breathing.You can remind your self with little sticky notes in you home or car or even send yourself a reminder on your cell phone.